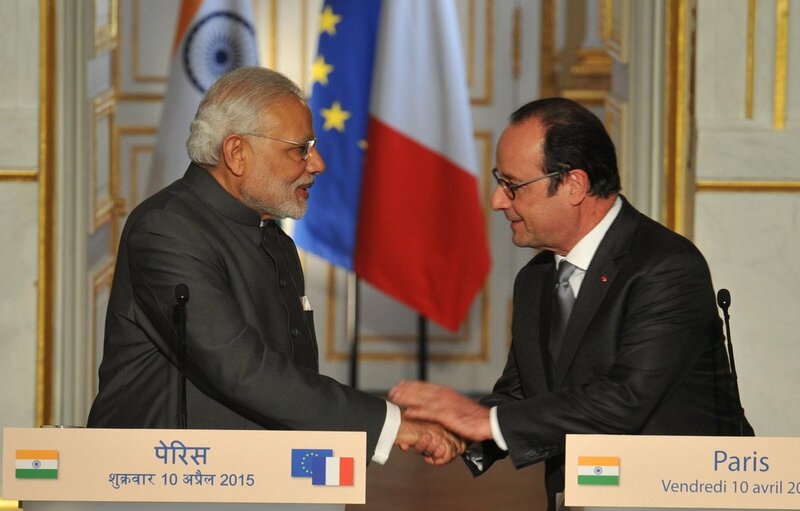 India and France signed 17 agreements, including on the stalled nuclear project in Jaitapur in Maharashtra, after Prime Minister Narendra Modi held wide-ranging talks with French President Francois Hollande. 1- An MoU was signed between Larsen and Tubro and AREVA aimed at cost reduction by increasing localisation, to improve the financial viability of the Jaitapur project. 2- The agreement will also enable transfer of technology and development of indigenous nuclear energy industry in India. 3- Pre-engineering agreements were inked between NPCIL and Areva which intend to bring clarity on all technical aspects of the plant so that all parties can firm up their price and optimise all provisions for risks still included at this stage in the costs of the project. 4- MoU was also signed between Indian Space Research Organisation (ISRO) and French National Centre for Space Studies (CNES) on the Indo-French Megha Tropiques satellite which was launched on board the Indian launch vehicle PSLV on October 12, 2011. 5- The MoU shall extend by two more years, the joint project for sharing and use of data from the satellite. 6- Under space cooperation, an agreement was also signed between ISRO and CNES. The agreement proposes cooperation in the areas of satellite remote sensing, satellite communications and satellite meteorology among others. 7- The two countries also signed agreements increasing bilateral cooperation in the economic sector. 8- A Railway protocol between Indian Ministry of Railways and French National Railways (SNCF) was also inked, seeking to establish cooperation between Indian and French Railways for semi-high speed rail and station renovation. 9- Marking a breakthrough in the protracted talks for striking the French Rafale jet deal, Prime Minister Narendra Modi announced that India would buy 36 of the fighter planes in flyaway condition, citing critical operational requirements of the Indian Air Force.